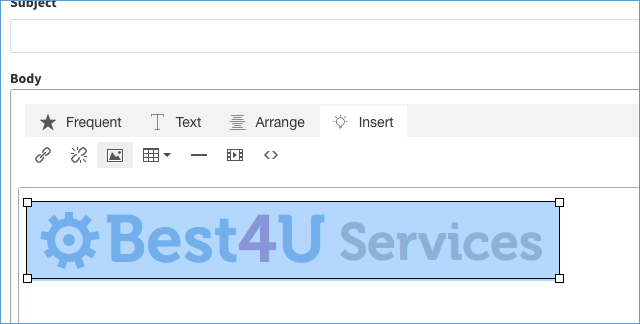 If you need to add an image to your email template, you will first need an image stored on a web server and accessible via a url link. Currently, Method does not allow you to upload images. 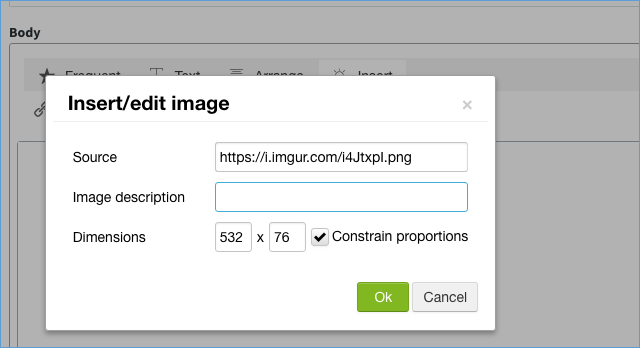 If you need a place to store your image, you can use an internet photo sharing site like imgur. Getting the URL link from this site can be tricky, however. In order to do this, you will need to right-click on the image, and select "Copy Image Address" or "Copy Link Address". You will know if you have the right link if it ends in a file extensions (such as .png or .jpg). In the following example, we will use imgur as the site which hosts our image. Our first step will be to upload it to the imgur website. If you already have a URL for your image, you can jump to step 3. 1. Upload logo to the imgur as a new post. 2. While viewing the image in imgur, right-click the image and choose "Copy Image Address" or "Copy Link Address" (Wording changes depending on browser). 4. 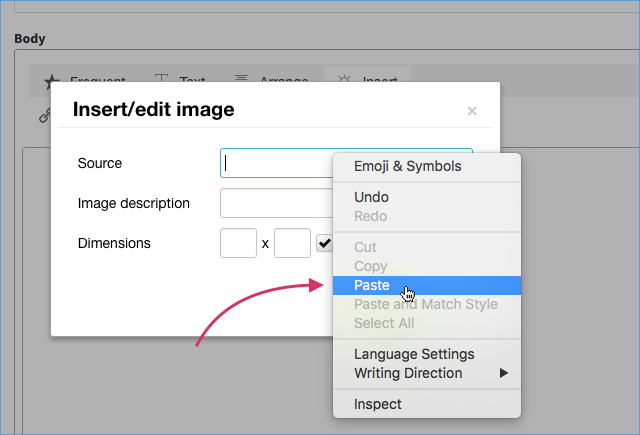 Select the Insert tab on the HTML Editor. 5. Select the Insert/edit image icon (looks like a picture). 6. When the prompt box pops up, paste in the Imgur link into Source. 7. Press tab! This is important so it will automatically fill in the dimensions for your image. 8. Constrain proportions: ensure this is checked. This will ensure the picture will be resized proportionally. It will not look stretched or squeezed. 9. Click Ok to insert the image. Make sure you save the template so your changes take effect.